Gabriella Hileman, Violet Forest, and May Waver, the cybertwee manifesto (2015). Waver's new work Embedded Lullabies, released yesterday as the latest in an impressive series of net art commissions by experimental online publishing startup NewHive, embodies the principles of sentimentality and sweetness celebrated in this text. 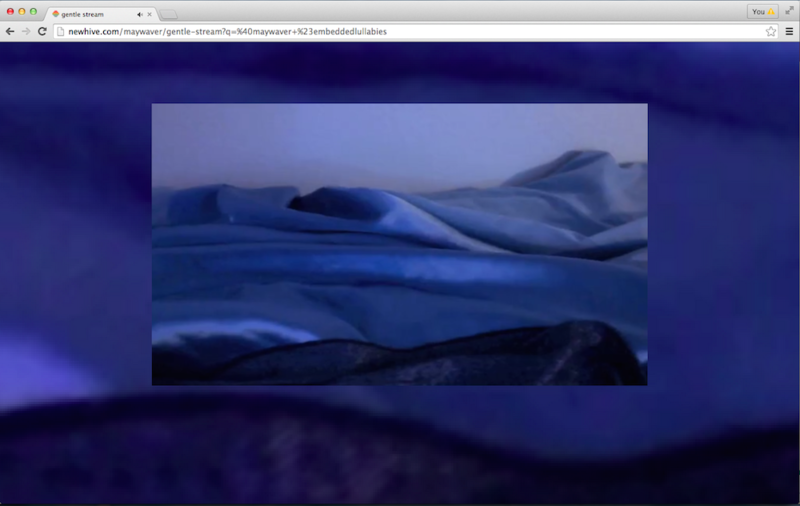 The project consists of home video footage of her bedding in various lights, overlaid against lo-res digital backdrops and accompanied by home recordings of the artist singing mournful love songs. The piece reminds me a lot of something you might have seen back in the day on a Joanie4Jackie tape, updated for the present-day web. Joanie4Jackie was a kind of home video chain letter/zine initiated by Miranda July in 1996; incidentally, a selection of the tapes are included in the touring exhibition "Alien She," opening on Sunday at the Orange County Museum of Art. But the context is very different. Joanie4Jackie was intended to circulate primarily in Riot grrl networks, while Embedded Lullabies will be stared at by a lot of lonely straight men too, even if the artist's body doesn't appear onscreen. Plus, of course, NewHive is a commercial company. The work's place in a different kind of libidinal attention economy seems to make Embedded Lullabies very different from Joanie4Jackie; as the always provocative Deanna Havas tweeted yesterday, "In the anarcho-capitalist present, girls make their own American apparel ads." To think of selfie-making (or bedroom videos) as only about economics, though, is a kind of vulgar Marxism. As the cybertweeists argue, "our sucre sickly sweet is intentional, our nectar is not just a lure, or a trap for passing flies, but a self indulgent intrapersonal biofeedback mechanism spelled in emoji and gentle selfies." Not outside of economics, but not outside of human emotion in all its weird manifestations, either. May Waver, Embedded Lullabies (2015). NewHive.